Color matches, makeovers, event makeup, bridal or private parties......we have our professional makeup artist and mineral makeup line ready. Whether for a special event or to create a daytime look, we are here to serve you. 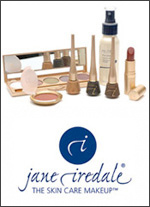 What is Jane Iredale mineral makeup? What can Jane Iredale do for my skin? Jane Iredale is healthy for the skin because it does not clog pores, contains no talc and has virtually no allergy risk. It also provides broad-spectrum UVA and UVB protection up to SPF 20. Jane Iredale offers complete coverage of skin conditions such as acne, rosacea and redness. Also, the minerals do not support the growth of bacteria like other makeup can. The skin care makeup lines include many shades of base, blush, lip product, eye product, concealer and facial spray. Accessories are also available, such as makeup bags and brushes. Are minerals appropriate for skin allergies? Minerals are better for those with sensitive skin. 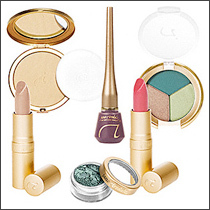 Since Jane Iredale uses ingredients that have health benefits, most people can use this makeup without any problems. Does Jane Iredale have sufficient coverage? Minerals provide excellent coverage, and Jane Iredale offers a variety of makeup brushes that allow complete control over the level of coverage desired. The end result is an opaque finish that does not feel heavy. Does Jane Iredale need reapplication during the day? Minerals are the perfect makeup for clients who do not have time for reapplication. With the proper application techniques, the makeup will last all day. How does Jane Iredale feel on the skin? Jane Iredale foundations are formulated to feel light-weight on the skin. Traditional makeup can feel heavy on the skin because of the unnatural ingredients. A makeup touch up can take as little as 10 minutes, or a makeup lesson can be 45 minutes. We take great pride on our artistry and give the time needed to enhance your professional, evening, or special occasion look. Do you do special event makeup? We welcome brides and bridal parties, formal event attendees, or just a group of friends hoping to have a fun, educational evening or lunch hour. Ask us about hosting a party at Radiance. For Jane Iredale in Fairfax, visit Radiance MedSpa today.